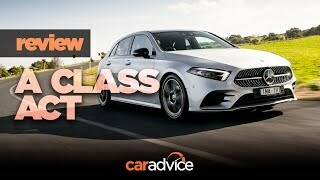 Visit bit.ly/PD-Merc or phone 00442838337373 / 02838337373 to talk to a Mercedes Benz A class expert and find the perfect Mercedes A Class AMG or any other Mercedes. 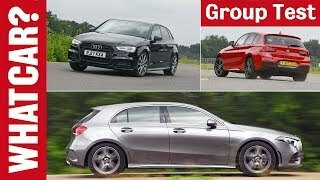 The stunning A Class AMG shown in our exclusive video brings premium technology and spec to the compact, stylish form of the celebrated A Class range. Discover superb innovation and detail, inside and out, including AMG styling and a featured-packed driver experience through the very latest in-car technology. 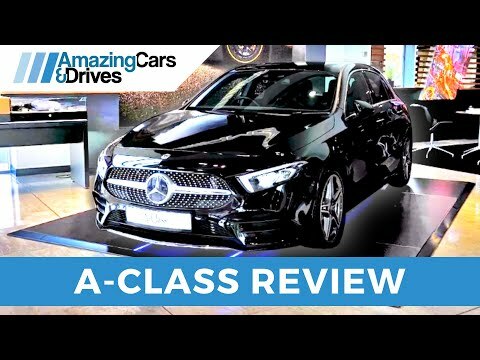 The A Class AMG has been during heads in Mercedes showrooms in Northern Ireland thanks external features like its striking AMG diffuser, radiator pins and bumper giving the front of the car peerless sleek and sporting looks. The model shown also includes fantastic AMG alloys plus side-skirts and twin exhaust. The high-end sense of detail continues into the cabin, with contrast stitching, optional aluminium trim and AMG styling. The car's keyless entry signals a state-of-the-art user experience to truly savour, from voice-activated commands (including satnav) to automated parking and ambient lighting. After all, The new, intuitive interface has been made exclusively for just one person – you. You can adapt every detail to exactly meet your driving style, with one swipe on the touchpad, steering wheel or on the new touchscreen. AND With 'Mercedes me connect', from checking your fuel level to locking your car with your smartphone, Mercedes me connect will make your life that little bit easier by providing you with a comprehensive range of services to support you while on the move. The A Class is also equipped with the latest active safety and driver assistance systems to ensure your safety and provide maximum convenience. 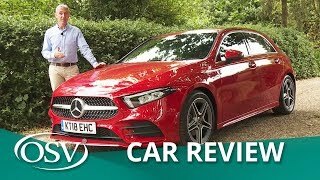 Car Magazine have, understandably, raved about the latest A Class: "For now, be satisfied that the new 2018 A-class is right near the top of the family hatch pile...rest assured, the beautifully finished cabin, surprise-and-delight tech and sharp drive make the Mk4 A-class a smash hit. We like." Why buy your Mercedes from Mercedes Portadown or Mercedes Belfast? 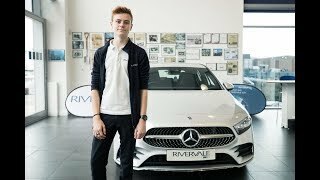 Simple: "Discover the Passion" – Mercedes-Benz are inspired by an enduring passion for the pursuit of excellence whilst continuing to develop and innovate. This inspiration keeps Mercedes-Benz at the pinnacle of automotive design and manufacture, and is in the DNA of Mercedes-Benz NI too. Part of the Agnew Group, Mercedes-Benz NI constantly strive to deliver the best possible experience to every customer and visitor in Belfast and Portadown. You'll find the latest Mercedes-Benz Cars, over 150 Approved Used Mercedes-Benz and one of the largest official Servicing and Workshop facilities in Northern Ireland. Here's what local Mercedes-Benz drivers have said about Northern Ireland's specialist Mercedes dealerships. - "I had narrowed my car search down to two cars one of which was a Mercedes. I turned up really expecting not to choose the A Class but after a dealing with Allan Douglas he really sold it to me. He was extremely friendly, helpful and had a great knowledge of the car and what was best suited to my needs. I would have no hesitation in recommending people to talk to him about a car." - "This is my 6th Mercedes-Benz due to the fact that Paul McNally and Mark Sargent in Portadown are two gentlemen that go the extra mile to ensure that when both my wife and I change our car and jeep we always have the Mercedes experience. Their hospitality never changes and they always put a smile on my face. I am made to feel welcome around them. In fact I couldn't fault any of the staff there. 10 Stars Mercedes-Benz Portadown, well done." The Agnew Group is a leading motor vehicle retailer group in Northern Ireland, whilst also being one of the UK’s top 25 franchised dealers. Established in 1931 our reputation and wealth of experience is second to none with friendly and professional staff who are dedicated to providing an outstanding customer service. The company is very much at the forefront of motor retailing and is dedicated to delivering exceptional levels of customer service. The business operates 17 dealerships around the Belfast and Portadown areas, representing ten prestigious manufacturer brands and 2 used car operations Agnew AutoStore and Agnew Autoexchange. In addition the business operates Agnew Corporate and Agnew Repair Centre. 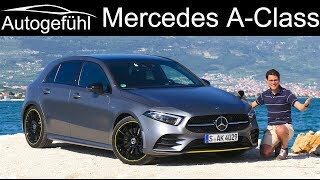 So if you are considering a new Mercedes A Class for 2019 - now is the perfect time to reach out to Agnew Cars and test drive this amazing Mercedes A Class. 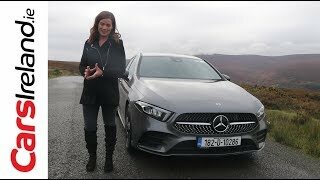 To recap our Mercedes review we loved the technology, the styling, drive, comfort-just how modern and fresh this new A class really is compared to the older models. 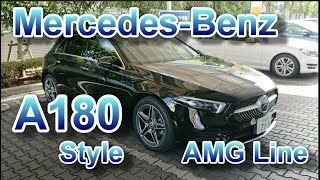 But also do consider this car as a prefect used Mercedes - Agnew of Portadown do also offer second hand Mercedes cars at excellent prices supported through their own in house finance packages. +Chris Barlow Just slightly jealous :) Enjoy, let us know what you think of it! Thank-you, def one of my favourites! This new A class AMG is just fire, if only I could afford it. What a ride ! 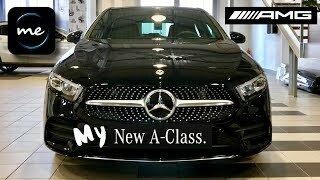 Picking up my A Class this Friday, can't wait. Thanks! Well have you enjoyed it so far? thinking about such a wife, she always uses heels, do you think it is possible to run in heels about 10 cm, have you tried ?. She doesn't want to change shoes every time she's going to drive, today she drives a Mercedes w211 to it's really easy to drive in heels. Count down is on - the black is gorgeous!! He did refer to the passenger side as the drivers side... no? I picked up on that too, also she called the centre consol the central reservation. This car is too small and too expensive...pass. Ken Cur also happened to prefer the interior! Ken Cur I’m getting my a class amg line (premium plus package) delivered to me in mid summer. 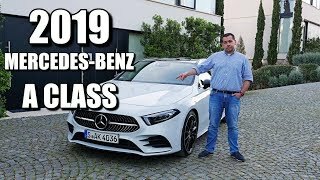 I could afford for example the c class but since this is going to be my first car I felt that this was a more practical option especially for parking etc.. , and insurance also worked out significantly cheaper! So I guess it depends on your predicament but for me right now the a class was the most perfect car. I always get the feeling that this it the Benz for those who cannot really afford one (and yet still an expensive car). Of course, a c class entry will cost similarly to a loaded a, but is that a wise thing to do? Any comments appreciated. Thanks Peter - for sure not for everyone....what's your favourite from the Mercedes range? Strange indeed - I am assuming still under warranty. How do you find the car drives? 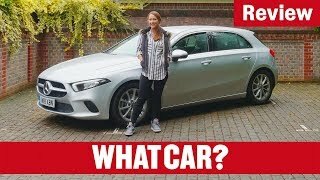 Is it a good car to have around London? 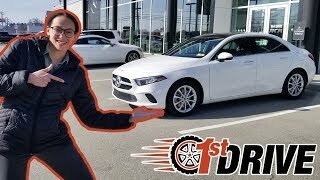 MrMem2011 have you had any other problems with it I want to buy a Mercedes but I’m worried about the reliability also why did you have a bad experience with the Service? Sounds fabulous - love the shade of red too!! Thank-you, do you have a favourite Mercedes? 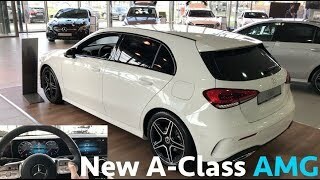 Getting my brand new Mountain Grey A Class AMG Line Premium middle of next month (still in Germany). Cannot wait. Great review - thanks. Very cool car. +Amazing Cars and Drives last week of february; I can't wait! Thank you, glad you enjoyed it. Has it arrived yet? +Abdullah Hadi Not long to go - are you on the count down? Got mine Dec ordered in Oct, you will love it very impressive bit of kit. it was alright till that parking job.....Ha! lol I need a bit more practice and time with the car....a subtle hint to Mercedes Benz ;-) Thanks for watching the video - hope you found it interesting....tempted by the car? Is it night black solid or cosmosblack metallic? This car is Cosmos Black Metallic :) Gorgeous isn't it! Great job with the review. 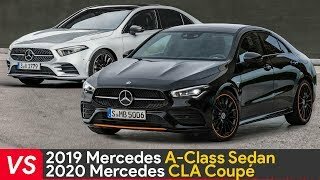 Car is amazing and Mercedes Benz is pointing very high on the entry level for a A Class. They set the new standard. 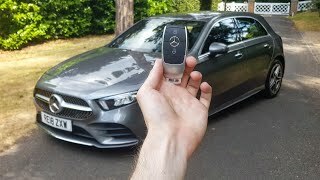 Thank you for the reply :-) Much appreciated - hope your having a great week....we are guessing your a fan of the new A Class.....it is a tempting car to be honest!! 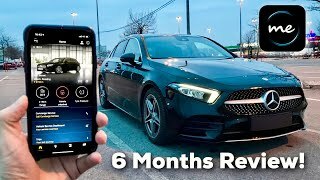 Do you have the A250 AMG Line review as well? +Ari Suhonen Don't think so 10 inch screens is premium package and I think from my order form AI comes in the separate advanced nav pack . 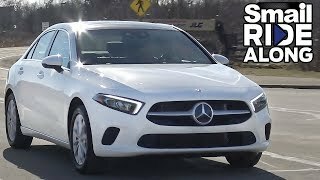 FIRST LOOK At My New 2019 MERCEDES A CLASS AMG Line!